Door details: Intersecting Gothic arch muntins give the cabinet doors an elegant demeanor well suited for showing off special pieces of china or silver. About the cabinetry: Custom cabinets sport satin lacquer that adds a subtle sheen. Swarovski crystal-studded hardware and delicate silver-painted beading inside the doors’ recessed panels add sparkle. The silver paint correlates with the kitchen’s stainless-steel accents. See more images from this kosher kitchen remodel. Door details: Leaded-glass door inserts, whose design motifs were inspired by a vintage bookcase, join weathered ceiling beams in giving this kitchen old-world flair. About this cabinetry: Creamy-white painted cabinets feature beaded detailing that frames each door and drawer-front for timeless style. 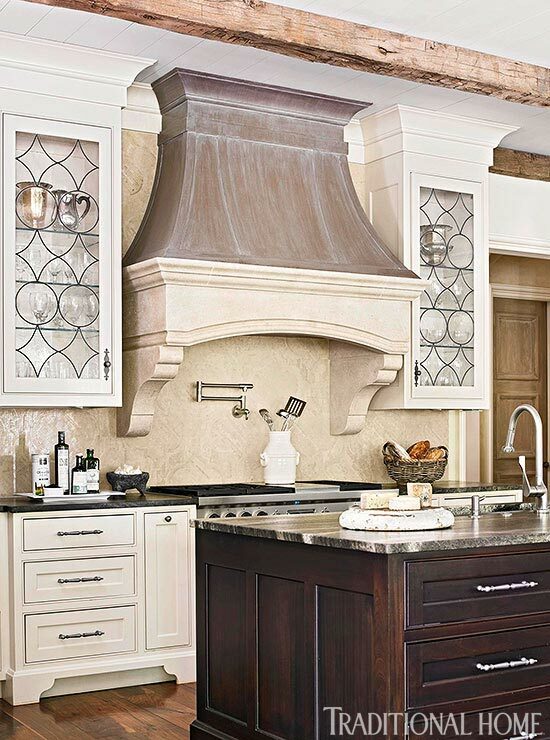 The kitchen’s wood range hood is painted to suggest hand-forged metal. Door details: Glass inserts form the fronts of these kitchen cabinets, which are constructed in front of the sunny kitchen windows. Clear glass was used to maximize the flow of sunlight into the room. About this cabinetry: Built against the kitchen’s windows, the main attraction of these cabinets is that their construction allows for an abundance of natural light. The colorful wares stored inside form an intriguing vignette. Door details: The kitchen’s built-in hutch includes doors whose inserts boast serpentine lead-came surrounding sparkling beveled-glass panes. The overall effect is reminiscent of the diamond grid found in many of the 1915 mansion’s original windows. About this cabinetry: Designed by Melissa Seibold, the hutch features burled alder door panels and crown molding along with the beveled-glass doors. See next slide for a close-up of the beveled glass door. See more images from this European-style redesign. Door details: Lead came separates beveled pieces of glass that are beautiful on their own, but also do a stellar job of showcasing exquisite glassware. Door details: This cabinet door showcases a wavy glass insert that reflects light in intriguing ways while obscuring cabinet contents. About these cabinets: Traditional-style cabinets feature recessed-panel doors and drawer fronts decorated with delicate beading and stainless-steel hardware. The pictured door is found to the left of the range, where the designer created an artful composition around the cooking area. Go to next slide to see cabinet doors from the butler’s pantry. See more from this classic Illinois kitchen. Door details: Upper cabinets sport glass-front doors teamed with glass shelves to create a light and airy look. About these cabinets: Found in the butler’s pantry, the cabinets feature a custom-painted finish teamed with polished-nickel hardware and an antique nickel backsplash. Door details: Cabinet doors boast muntins and clear-glass inserts that showcase the homeowner’s glassware and blue-and-white porcelain against a background painted with Farrow & Ball's "Blazer" red. About this cabinetry: Painted the same yellow as the doors, interior shelves are placed at the exact height as muntin crossbars to simplify the overall display. See more images from this colorful home. 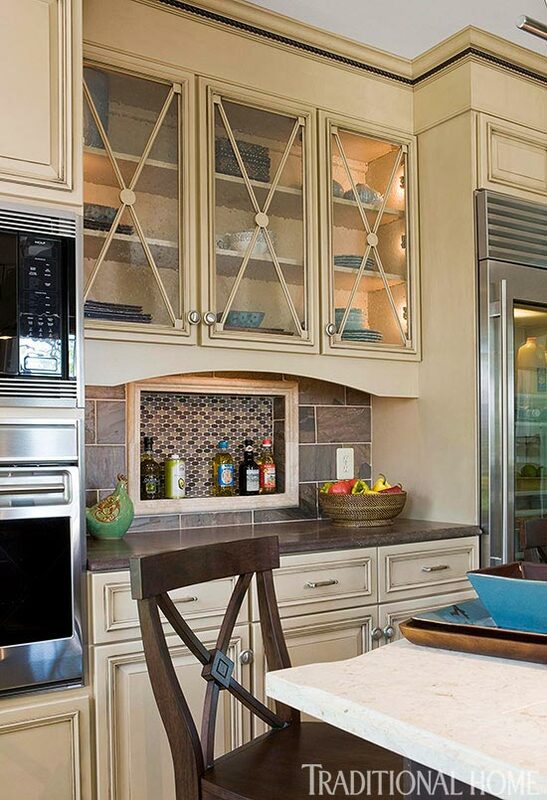 About this cabinetry: A recent remodel was aimed at opening up the kitchen for optimal flow. This was achieved in part by removing the far wall between the workspace and the pantry and replacing it with glass cabinetry. Pass-through windows below the cabinets heighten the transparency and accessibility of the kitchen. Door details: White doors frame leaded-glass inserts whose rectilinear lines echo the angles seen in 30 drawer fronts below. About the cabinetry: Above the cabinet boxes, a row of leaded-glass windows follows the curve of an arched niche in the kitchen wall. Although recently installed, the cabinetry suggests early 20th-century Arts-and-Crafts architecture. See more images from this Chicago apartment. Door details: Seeded-glass door inserts stand behind X-motif muntins that echo a diamond grid in one of the home’s original windows. This feature helps the kitchen blend in with the home’s late 1920s architecture. About the cabinetry: The maple cabinets are painted linen white and rubbed with a truffle-colored glaze. Simple raised panels on the doors are outlined with molding to add depth. See more images from this Baltimore Symphony Showhouse kitchen. Door details: Mullion doors frame seeded-glass inserts that enhance the cabinetry’s look of age. About this cabinetry: Combining upper cabinets and base cabinets with a beaded-board backsplash enhances the breakfront façade of this cabinetry. 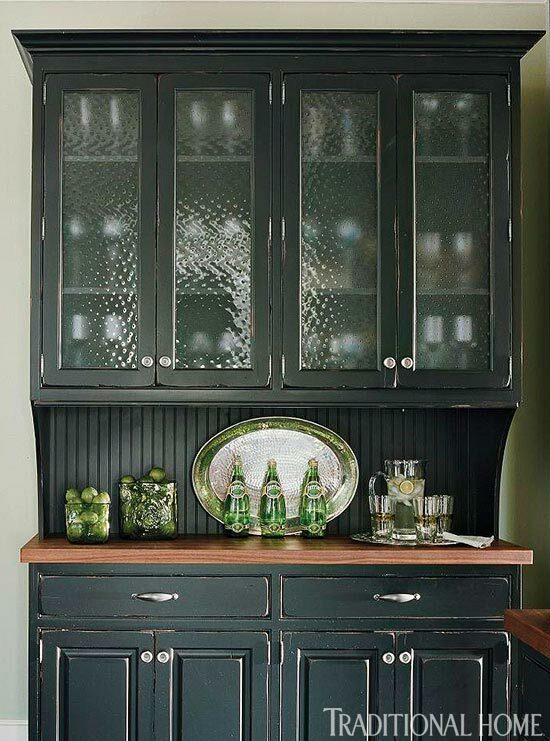 The black-painted finish is distressed for greater depth. Zinc knobs are glazed in black to suggest patina. Door details: The glass-front doors on this stand-alone bookcase are embellished with delicately proportioned muntins in a circular motif. About the cabinetry: The bespoke Cherington bookcase from William Yeoward also features hand-turned urns along its elegantly contoured top. See more images from this sophisticated Chicago kitchen. About this cabinetry: A wall of two-sided cabinets with upper glass doors that open to the kitchen on one side and the dining room on the other elegantly links the two rooms and doubles the function. The transparency between rooms helps to ease the flow, as well as allowing light to filter throughout both spaces. Dishes and glassware are easily accessed from either side. Door details: Mullion doors feature diamond-shape panes of seeded glass that give the furniture-style china cabinet a beautifully aged appearance. About these cabinets: This kitchen was part of the Hampton Designer Showhouse in Bridgehampton, New York. In addition to the glass-front china cabinet, the white cabinetry features recessed panel doors accented by pilasters, carved corbels, and a plate rack above the kitchen sink. See more images from this showhouse kitchen. Door details: Aluminum doors with frosted-glass inserts give the top row of cabinets a lighter attitude. The glass-front cabinets feature interior lights on dimmers; they can be illuminated at various intensities depending upon the occasion and the desired mood. About this cabinetry: From Plain & Fancy, this cabinetry features quarter-sawn red oak construction in two different finishes: natural with black glaze, and ebony. See more images from the Built for Women III Showhouse in Woodstock, Georgia. Door details: Leaded-glass panels are constructed with textured glass to create an old-world feel. 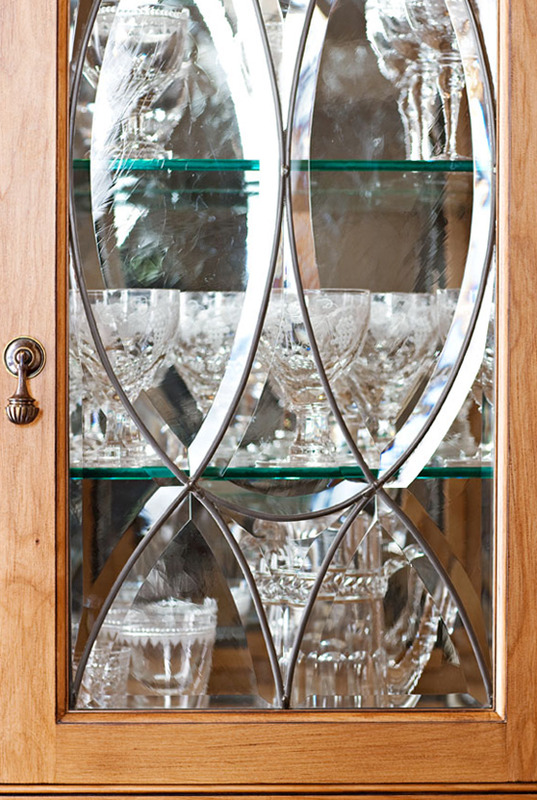 Eye-catching beveled-glass circles draw attention to the display of dishes and glassware found in the butler’s pantry. Door details: Silver-nickel upper cabinets include clear glass inserts and glass shelves that put barware at best advantage. About this cabinetry: In this bar area, lacquered-walnut lower cabinets sport chunky polished-nickel hardware to give the kitchen the traditional-with-a-twist look desired by the homeowners. The silver-nickel countertop, sink, and mirrored backsplash give the area a hint of glamour. See more images from this family-friendly kitchen. 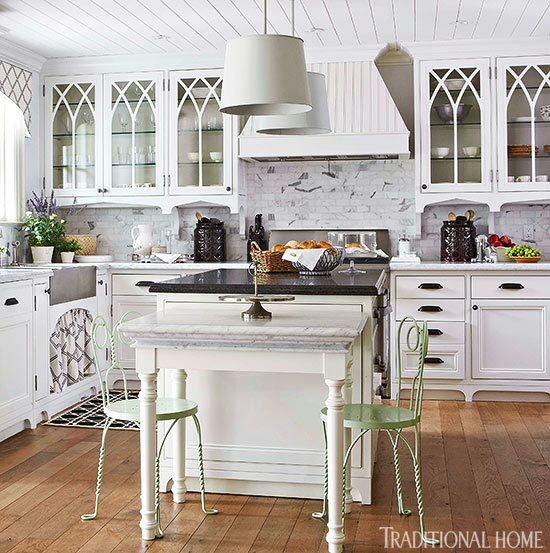 Door details: Gothic-inspired arched muntins are a dramatic design element in this kitchen. The curves of the arches are reflected in the graphic pattern of the sink skirt and valence above. About this cabinetry: By painting the muntins white to flow with the rest of the kitchen, drama is kept to a minimum. This allows for the more traditional details of the kitchen to take center stage. 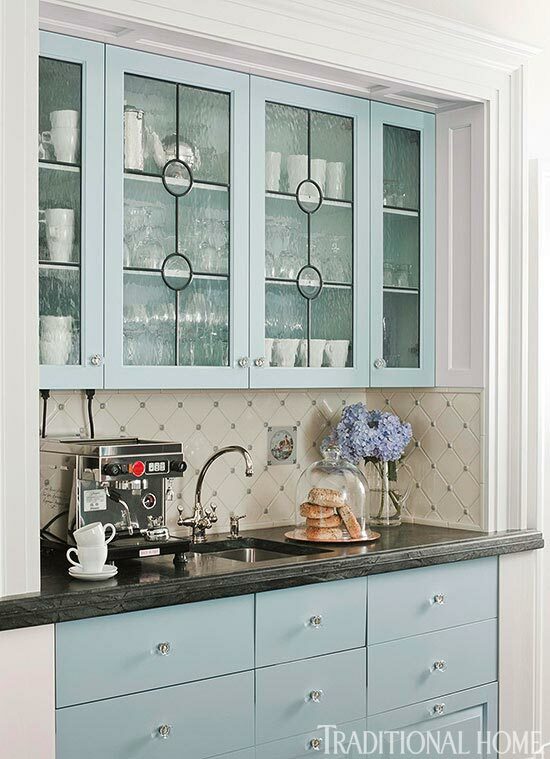 About this cabinetry: Unembellished glass inserts and glass shelving inside keep these cabinets clean and simple. White paint, traditional molding, and lots of windows throughout the space keep the light flowing and the aesthetic lovely and low-maintenance. See more of this lovely remodeled ranch house. Door details: The narrow cabinets feature delicate glass inserts, drawing the eye up and highlighting the height and architectural detailing of the ceiling. About this cabinetry: Cabinets throughout possess the same narrow dimensions and clean molding details, serving to visually unify the space. Tour the rest of this summer home. Click here for more cabinet inspiration in our presentation of Elegant Kitchens with Warm Wood Cabinets.